Mujitsu and Tairaku's Shakuhachi BBQ / How many shakuhachi players can't whistle? » How many shakuhachi players can't whistle? How many shakuhachi players can't whistle? I started wondering because of the humorous response post in the teachers section to the embouchure lessons. Vanessa Redgrave, or whoever that was says "just put your lips together and blow". Well, I can't whistle no matter how much I try. I wonder how many shakuhachi players can't whistle, and if it affects shakuhachi playing at all. Re: How many shakuhachi players can't whistle? Oddly enough, I can whistle just fine. I'm not that good at doing it by using my fingers to direct the air but I can whistle just fine by only using my lips. I can do it by both taking air in and blowing it out which is useful in keeping the music going forever. Not too long ago I learned to overblow the same way you overblow shakuhachi to produce extremely high sounds. Good for annoying the people near you because the highest sounds seriously hurt your ears. Blowing extremely high or extremely low sounds is good practice for the lips. On most days I can actually whistle along with a 1.8 shakuhachi. The lowest notes get a bit tricky and it is difficult to make them really loud. Needless to say, I memorized some pieces by learning to whistle them so that I can "play" honkyoku even when I don't have a flute with me. Some techniques are more difficult to reproduce than others. I find that certain pieces sound rather nice like that. It works better on pieces that are faster and don't rely too much on tone color. Sanya Sugagaki makes for a great whistling piece in my experience and you learn the sometimes unintuitive rhythm at the same time. "Vanessa Redgrave, or whoever that was says "just put your lips together and blow". " RadiOgnome, I hate to say it but I have found that people who can't whistle have a lot of trouble playing shakuhachi. Maybe someone who can't whistle but plays well will come on and add support for those in that boat. The only person I have found in 26 years who couldn't make a sound also curled his tongue when blowing. He was completely unconscious of this until trying shakuhachi and, of course, he couldn't whistle. I can barely whistle and with no musicality. Hey, that describes all my other endeavors as well. My teacher Nyoraku can whistle entire sankyoku pieces in tune and with great detail and expression. Maybe they should have a concert at the festival for people who whistle shakuhachi music. Sounds good for me then. I can whistle both while blowing or taking air in. Heck, I can whistle even with my mouth open. That one is difficult to explain but it feels like there is pressure in your upper back part of the mouth. The air somehow circulates there and creates similar sound. I find that technique to be useful for producing really high sounds as it is easier to "overblow" it. By doing it that way you can actually open up your mouth almost completely and still make a good sound. As an additional parlor trick, I can blow both Otsu and Kan notes even with my mouth pretty much open by utilizing the same technique and pressurizing the air well before it hits the mouth. Useless for playing, I'm sure, but fun to do none the less. One question though. Why are whistling and blowing related? I don't think that I blow like I whistle, so being able to do one shouldn't instantly qualify someone to do the other. Is it a matter of controlling your mouth and/or your tongue? RadiOgnome, I hate to say it but I have found that people who can't whistle have a lot of trouble playing shakuhachi. Hey, wait a minute! That might be good for Amokrun, who can whistle very well, but it kind of troubles me because I can't whistle. Maybe someone who can't whistle but plays well will come on and add support for those in that boat. OK, I can't say I play well because I don't know Japanese music and I've only been focusing on shakuhachi for just a little over a year, but I don't think I'm doing too badly. If you check out my website, www.myspace.com/charleskoeppen , the 2nd track is an example of my playing a few months ago. I know it sounds kind of bad, but part of that is because I used an out of tune flute (but I like the tone and looks of it) and pretty much threw the track together forgetting musicality because I wanted to demonstrate to some people here on this forum that circular breathing on shakuhachi isn't as hard or unuseful as many thought it was. The only person I have found in 26 years who couldn't make a sound also curled his tongue when blowing. He was completely unconscious of this until trying shakuhachi and, of course, he couldn't whistle. I'm not sure I understand this. I get that he couldn't get a sound out of shakuhachi, but when was he curling his tongue before trying shakuhachi? While trying to whistle??? I hope I'm not sounding upset with this post, I'm not. Tairaku, who related that he couldn't whistle much, is proof that people who can't whistle much can still play at a high level. I might be a bit different since I can't whistle at all. It could be that I won't be able to achieve a high level of playing because of it, I'm not sure. I kind of suspect there are bigger hurdles, psychological and logistical ones mostly, that are more likely to keep me from achieving a high level. But, physical differences are real and can affect playing any instrument. Sometimes they can be worked around and sometimes they can't. For example, Jeremy Steig injured his lip severely in an accident early in his career but went on to be a legendary jazz flutist. While the observation that non-whistlers might have a hard time learning shakuhachi could be true, it would be a shame if anyone took it as a discouragement. I've heard stories of elementary school teachers doing this sort of thing in choosing instruments for children. 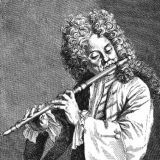 Can you imagine being told as a child "nope you can't play flute because you don't have flutist lips"? Yikes! BTW, I've heard very old recordings of whistlers who were simply incredible. I once tried to play trumpet. It took me about an hour to get to the point where I could get the basic sounds and also produce the first couple of overblowed series. I think my whistling practice helped a lot there because the embouchure was a lot like the one I use when I whistle. On the other hand, that embouchure doesn't help me at all with shakuhachi. With trumpet you squeeze your lips together and sort of form a small tube out of them. With shakuhachi it's more about pulling them to the sides and forming a small opening. I found these two techniques to be completely different from the viewpoint of how it feels. Odds are that I'd make a much better trumpet player than a shakuhachi player. Still, I play what I like because I don't think that I could ever produce interesting music with an instrument that I'm not interested in. Wanting to do something goes a long way in overcoming obstacles. I don't honestly care how well suited I am for playing shakuhachi. My philosophy with learning things I want to learn is that you either learn it or you die trying. If you die trying, well, you won't really be around to know that you didn't get it right. If someone is a better player right from beginning, well, you just double your efforts and you'll get there eventually. Whistling is an aquired skill. Playing shakuhachi is an aquired skill. I cannot whistle because I have not aquired the skill. I can play shakuhachi because I have aquired the skills necessary, although at a student level. I can also play several other ethnic flutes, including hopi and anasazi style, without being able to whistle. I can see that the two may have something in common for memorization of pieces, but cannot see that not being able to whistle would have anything to do with aquiring musical skill on any instrument. Tairaku is a case in point, as well as just being a case period. I'm not so sure in my case. I've tried to whistle enough without getting any sound that I'd say it's a physical thing, particularly when I see so many people happily whistling away without being mystified by it or giving any indication that they have learned a difficult skill. For me it's just as elusive as playing ney, however I learned to blow the ney because I knew it was a very difficult instrument and put in the hours. It also helped that I was able to get a little chirp out of the ney occassionally while learning. Whistling, and I'm not talking about the high level whistlers in the old recordings, is supposed to be easy, just put your lips together and blow. This is kind of off-topic, but to give an idea of how elusive getting a sound from ney is, since I was doing so well playing right-handed I thought I'd try playing left-handed. It was like being an absolute beginner again, I could barely get a chirp with several hours of trying. It makes me wonder how the ancients ever dscovered that they could play the things in the first place. I think one of the reasons that most people learn to whistle is because you can practice it almost anywhere and whenever you like. No special materials required. I often whistle something whenever I'm doing something boring. If you add up all these hours, it amounts to lots and lots of practice - an amount that would be very difficult to obtain with shakuhachi because you can't just type something on your computer and play shakuhachi at the same time. Furthermore, I've been doing it since I was a little kid which basically means that by now I've been doing it for, say, fifteen years at least. Odds are that you'll learn to do most anything to some degree with fifteen years of daily practice. The difficult part with practicing instruments is that you need to physically have the instrument with you and you often can't do anything else at the same time. I used to have an ocarina which I would play for fun whenever I was bored. It was small enough that I could carry it with me and simple enough that it didn't require a whole lot of concentration to play. As the result I learned to blow all sorts of things on it even though I never really tried to learn to play it. I was merely killing time. I never had that with shakuhachi because you need to actually sit down, focus on the task, unwrap the shakuhachi and then start blowing. All the hand-waving involved often takes so much time that you can't just practice for two minutes and then do something else like you can with ocarina. Here's one thing that may or may not work. Instead of producing the sound with your mouth, try to produce it with your tongue by closing down your throat partially with the back of your tongue. Your lips don't matter much if you do it like this. Sound can be altered by changing the shape of your mouth by moving lips and cheeks but it should be possible to get some kind of sound by just ignoring all that. To find the right spot you can try to first blow so that you hear a clear and loud sound of the wind moving out of your mouth. When you get this, just move the back of your tongue until it partially blocks the throat. At some point you should start getting a whistling tone. At this point the rest of the mouth can adjust the sound. I can produce the lowest sounds using this method. It works for roughly the lowest octave and half, give or take. Going past that for me requires falling back to the normal whistling with your lips. I often whistle short extracts of Shakuhachi music while walking around. I try to change the shape of the mouth to add resonance and some dynamics and it's a lot of fun. I also find a a good way of being "practicing" Shakuhachi music while I'm away from the instrument (which unfortunately is much more than what I would like to), for example by controling the flow of air by using the diapragm (well, at least thats what I think I do!). As for learning how to wistle. I don't remeber when I learned with just the lips but I remember very vividly having taken the conscious decision that I needed to learn how to whistle using the fingers (I thought it was cool back then and that it would be an unvaluable aid to call taxis ), and I just sat down for several days, or maybe weeks, whenever I had spare time at school to try to get a sound, and after a while, first with two hands, then with one, I learned (now I sometimes do use it to call taxis!). I had a student a number of years back that could not only whistle excellently (I'm not too bad myself ! ), but he could actually imitate a Shakuhachi EXCELLENTLY while singing. He could actually sing whole HONKYOKU and it would sound like he was playing the flute. I told him that there was really no need for him to keep plying!